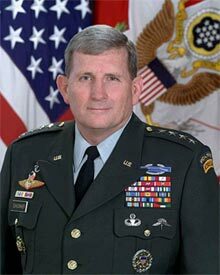 Retired U.S. Army General Peter J. Schoomaker once said: "Peak performance is not a destination; it is a constant in life. We need to get good at it by applying these principles to the whole organization as a culture... This needs to be part of our everyday lives." General Schoomaker was referring to an individual commitment toward the adoption of a relentless pursuit of excellence in all that we do. Anyone can be great at something once if they work at it; however, without consistency in performance that brings predictability, an individual or team can really only count on the lowest level of performance that they have previously displayed going into a new performance situation. The key to sustaining higher performance levels that contribute to confidence and predictability of future performances is to integrate the below five key elements taken from the fields of Applied Psychology, Performance Psychology, and Sport Psychology. The following programs are proven through extensive successful application with a variety of demographics including business and non-profit organizations, athletes and teams, military and uniform services, educators and students as well as with individual clients in a coaching capacity. Even the most detailed of performance plans entirely depend on one’s ability to overcome obstacles and thrive in an atmosphere of constantly changing adverse variables that stand between them and their desired performance outcome. This is especially true for collective performances. When engaging in a demanding performance situation, it is essential to possess the ability to overcome obstacles in order to attain superior outcomes. The Pursing Excellence family of programs is designed to facilitate the development of a personality structure that provides the capacity for “mental toughness” during times of adversity, hardship, or under unfavorable conditions without deviation from an established level of performance. The amount of success one achieves in their life is directly proportional to the amount of effort they apply to staying disciplined to their personal philosophy of excellence. Most people are not quite clear on what excellence is. In truth, excellence is defined differently by person and usually does not contain structure or have a philosophy behind it. In order to reach one’s performance potential, one must first clearly define for themselves what excellence is. Once a person has deter¬mined what excellence looks like to them they can create a plan to move closer to attaining their performance goals or move their life in the right direction. To stay on the path to achieving excellence in life, it is important for one to exhibit a level of discipline that most people are unwilling to put forth. It is important to understand that it is not human nature to excel at anything. It is human nature to take the most direct route to completion of a task without expending any unnecessary effort. A person needs a reason to exceed the minimal standard in a performance. They need to desire to excel as a result of some higher sense of purpose which feeds their motivation. Many people talk about excellence, many say they want to be more productive, successful, or hap¬pier; however, it is rare for a per-son to apply a con¬sis¬tent discipline in order to turn their personal performance plan into goal attainment.
. . . 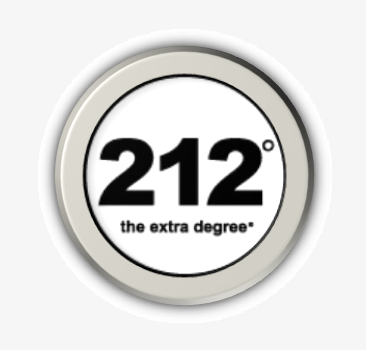 It is common knowledge that if water is heated to a temperature of 211 degrees Fahrenheit it is very hot. It is also known that 212 degrees Fahrenheit water begins to boil and becomes steam. Steam is powerful enough to move a turbine to make electricity or provide heat to a building. It is amazing what a difference one degree can make with something as simple as water. Most people do not realize it, but their life is actually like the temperature of water. A little extra effort can mean the difference between reaching performance excellence, and performing to a lesser standard; the difference between reaching one’s goals and not reaching them. Too often, people give up when the goal might have been just out of reach. Whatever it is one is setting out to do, whatever goal they seek to achieve, they should push themselves to reach their individual or team performance potential. This is a task requiring a self-regulated relentless pursuit of excellence in order for one to reach their true potential. Habitual effective thinking habits are critical; however, Self-regulation starts with a commitment to excellence. Desire, determination, and the will to achieve are essential elements to reaching one's true potential in performance. The mindset for excellence begins with an understanding of the psychology of high performance and knowing how the mind works to allow a person to gain the true belief that they have everything they need to perform to their potential, and deserve to reach their performance objectives, as a result of the work they have put forth to achieve it. This is the foundation for confidence, and as human beings we all possess the ability to enjoy the benefits of confidence by making the correct choices in how we think, feel, and believe about ourselves combined with a commitment to apply the effort necessary to earn it. An accurate description for the mindset for excellence is the relentless effective thinking habits that contribute to superior performances. The first step to achieving excellence in performance is to know what you want to do. Motivation is a person's or teams desire and energy directed toward the attainment of a personal or collective goal. Goals should be specific enough so that a person or team knows when they have reached their outcome objective in performance, and benchmarked along a timeline for continuous improvement. Measureable outcome goals that are broken down into clearly defined priorities combined with a plan to reaffirm commitment to achieving those objectives are the foundation to any great personal or team performance Plan. A great performance plan is one that is detailed, yet agile enough to anticipate adversity and navigate through or around obstacles while enabling the person to stay focused on their performance objectives. The ability to sustain one's focus is critical to achieving performance objectives. Performance consistency is achieved through a commitment to good preparation, execution, and recovery strategies that are applied with a continuous improvement philosophy. The difference between a good performance and great performance almost always depends on the level of ability a person possesses to control their attention and the effects of stress on both their mind and body. The demands placed on the mind and body is adversity against the pursuit of excellence that we sometimes call stress, pressure, or distraction. Every task no matter how complex has its own unique requirement for attention (be it broad or narrow focus) and the energy needed to achieve excellence once, or to sustain higher levels of performance task long. The understanding of how stress operates within the human body applied to mastering techniques of recovery and energy management is the antidote to burnout and fatigue. This skill combined with the ability to fluidly adjust focus and concentration levels to meet demands fosters hardiness and resiliency in the face of adversity. The process of seeing, feeling, and experiencing desired outcomes and taking actions to attain them builds confidence and a readiness to move forward and achieve excellence. Mental rehearsal combines the key concepts from the previous four mental skills competencies into one powerful strategy. Imagery involves thinking effectively, staying focused on objectives and intent for accomplishment, troubleshooting the plan to anticipate adversity, and rehearsing the plan for overcoming distractions and managing energy levels. Mental Rehearsal expedites the mastering of performance measures as well as the mission itself. When was the last time you wanted something so bad that you felt as if you would do just about anything to get it? What did that feel like? Most people describe it as an intense desire, determination, and willingness to give 100% effort toward something that is deeply meaningful to them. The majority of people do not understand what giving 100% effort to a task is, or how to make the intense commitment to excellence required to achieve greatness. Soldiers in combat operations perform at high levels of proficiency collectively in the interest of self-preservation. Athletes and business professionals lack that life threatening incentive that instinctively pushes them to reach their performance potential. The "warrior spirit" can be cultivated with a training program designed to increase the "Value" and "Commitment" a person places on a performance. These are critical elements to reaching a person's potential in a performance situation. OBJECTIVE: Sustainability in higher performance levels while reducing the effects of stress. It is highly recommend that performance improvement programs be executed in five phases:Planning, education, intervention, application, and assessment. PHASE 1 – Planning (Resource, In-Take, Assessment of Needs):Preparation strategy – identify attainable performance objectives that are specific and measureable within the situation, circumstance, or task. Establish outcome measure and deliverables, reporting criteria, and a timeline of events. PHASE 2 –Education:Preparation strategy – Each program is based on science and implemented utilizing best practices in the fields of applied psychology, education, and sport psychology. To develop a sold personal performance improvement program it is important to possess strong baseline knowledge in the area of focus and practice utilizing advanced tools such as biofeedback that teach regulation. PHASE 3 – Intervention:Execution strategy – Develop a strong personal performance plan and refine it for maximum results including psychomotor habitual responsiveness in desired behaviors and effective thinking. Adversity comes in many forms and it is impossible to anticipate for every possible variable; however, by through practice and revision a plan becomes more agile to adversity enabling hardiness in performance. PHASE 4 – Application:Execution strategy –The ability to trust yourself to make the right decisions when adversity comes, and the confidence to believe that you have earned the right to perform at your true potential, is critical in application. Application is the moment that the personal performance plan was originally created for. In this phase the person performs with a mindset that facilitates one's performance potential while being hardy and resilient in the face of adversity. Effective Leadership boosts productivity, influences subordinates for high moral, preserves resources and fosters an atmosphere of excellence. Leadership is a philosophical art form that draws on a person’s individual experience, values, and a capability relating to their ability to influence a person’s,or groups, thoughts or behaviors. Obtaining enough experience to perform at high levels can take a lifetime to achieve if relying solely on lessons learned from past situations. Establishing structure to one’s leadership helps expedite growth in the art of providing direction and purpose, and inspiring motivation in subordinates. This leadership development program is design to build personalized structure to a person’s leadership thatcontributes to the enhancement of personal growth. Develop a structured personal leadership plan that is dynamic, influential, and solution focused. Learn individual strengths and weaknesses, and how to navigate through adversity working within these limitations. Create a plan to effectively utilize power, authority, and influence with respect for individual, organizational, and ethical boundaries. Identify and classify strengths and weaknesses in subordinates, and develop individual performance improvement programs that inspire hardiness in subordinates against adversity. Effective team communication is a task essential requirement for leadershipat every level. Effective communication serves to establish harmoniousrelationships within a team, facilitates clear understanding, fosters anatmosphere for creativity and sharing of ideas, and builds synergy between teammembers that improves team performance. Effective verbal and non-verbalcommunication is an essential requirement for cohesion. Some members of a teammay understand that their communication skills need to be improved; however,many are not certain how to improve them. Increase understanding and appreciation of the dynamics of human communication. Learn and utilize techniques to improve communication through a heightened understanding of the structure and complexity of an overall message, and gain an appreciation for the leader’s, manager’s, or coach’s intent for the accomplishment of a task. Raise productivity as a result of minimizing wasted time and resources created as a byproduct of ineffective communication. Learn and apply the principles of effective group dynamics and team communications. Demonstrate and sustain high levels of team synergy at times of adversity. Develop and agree upon team values and norms, and draft a contract for all members to sign. Create a routine(s) to streamline effective team communications that facilitates swift agreement on performance objectives in planning, and/or in response to adversity during execution of a tough and demanding task. Motivation is a person’s desire and energy directed toward achievementof a goal. Contrary to what many believe, it is not human nature to excel at atask. It is human nature for a person to provide only the amount of energy andfocus needed for a perceived minimal expectable effort. A person needs a reasonto excel that is either for themselves or because of some outside influencethat drives them to excel. Successful leaders, managers, and coaches strive toprovide their subordinates with detailed direction that instills a sense ofpurpose at a level that the subordinates hold valuable to them personally. Thisboosts individual productivity. Learn what motivation is, and how to cultivate desire and determination to achieve excellence. Put into practice the thought processes that contribute to increasing one’s desire and determination to achieve excellence. Create the conditions for a person or team to reach their true performance potential through effective thinking habits that feed a culture of excellence. Adaptive thinking is the result of a conditioned process that utilizesproven techniques in effective thinking and decision making performedhabitually to deliver hardiness and resiliency in the presence of adversity.The training begins with an understanding of cognition and how we attend to ourworld, the components of memory (recall and recognition), and the establishmentof routines and attention (focus) cues designed to engage the subconscious mindto take action in different settings. In the case of spatial cues, they can bedeep in a person’s peripheral field, and with spatial recognitionconditioning similar to the behavioral cues a lifeguard looks for to savelives, a person will habitually respond to with desirable behaviors. Recognize and prioritize objectives in adverse high stress situations. Identify the requirement for focus and concentration for a task, and smoothly adjust to meet those requirements. Develop routines to enable the successful navigation through adversity without performance level deviation at a moment when you are forced to act without the time to properly analyze and prepar. Feel confident in your ability to perform in any adverse situation. Learn functional techniques in energy regulation through biofeedback. A strong personal or team performance plan includes the implementation ofpreparation, execution, and recovery procedures that lead to higher performancelevels while fostering the conditions that allow for hardiness and resiliencyto mental and physical demands. Topic areas addressed in the individual andteam performance enhancement model include spatial recognition, verbal andnonverbal communications, effective thinking, psycho-motor conditioning,decision making, selection of required action based on cues, and managingstress through effective regulation of energy usage through biofeedback. Learn and practice the practical skills that foster a mindset for excellence in all that you do through the identification of performance objectives, effective thinking habits, management of internal resources, utilizing cue initiated routines, and use of mental rehearsal. Identify personal strengths and weaknesses in physical and cognitive abilities, and conduct an assessment to identify personal needs based on this information. Identify the psychological factors that affect individual and team performance, and then utilize the information to create a specific plan of action that meets an individual’s or team’s performance objective. Measurably increase performance while meeting the performance objectives created in a detailed personal performance plan. The Performance Aptitude Measurement (PAM) is a cognitive processingassessment tool used to assist an individual in the development of mental,emotional, and behavioral conditioning programs that cater to their specificand unique needs. The PAM combines a written cognitive processing assessmentwith an interview performed by a certified professional. The value of the PAMto businesses organizations, professional athletics, and the military, is inhow it identifiesindividual strengths and weaknesses in the processingofcomplex sensory information a person receives. The processing ability aperson possesses translates to a behavioral response under adversity.Understanding the processing strengths and weaknesses in an individual is thefirst step in the creation of a viable personal performance program that yieldsresults more quickly than with conventional mechanisms. Deliver business professionals, athletic coaches, and individuals’ information critical to reaching one’s true performance potential. Creation of personal performance plans based on the latest science behind human performance. Condition the mind for effective thinking based on strengths in cognitive processing. Improve weaker areas in cognitive processing by developing a personal performance plan designed to specifically address these processing domain. The Motivational Achievement Plan is a self-development tool created toempower a person to reach their true potential in a performance situation, andincrease daily productivity. This is accomplished through a program designed tocenter and individuals focus, preserve energy, and reaffirm critical objectivesdaily amidst high levels of distractions and other forms of human adversity andwasteful practices. The MAP focuses on individual integrity, or wholeness, ofthe person engaged in the plan. Developmental areas include: IntellectualDevelopment, Leader/Manager Development, Physical Development, SpiritualDevelopment, Ethical Development, and Social Development. Part 1 – IdentifyObjectives: In this part a person will identify what their goalsare within a given aspect of their life. Part 2 – Identify ResourcesRequired: This part aids a person in resourcing what it will taketo accomplish their goals, and then prioritize them in each area. Part 3 – Create a Plan ofAction: Part 3 is a comprehensive plan of action to accomplish aset goal. Part 4 – SustainmentPlan:This part is a plan for continually re-affirming oneself toa personal commitment made at the beginning of the goal setting and planningprocess in order to stay on the path toward goal achievement. Part 5 – Create SupportingRoutines – This part is a personal routine development planin support of a one’s goal plan. Part 6 – Daily T0-DOList: In part six, a person learns the importance of establishingdaily goal plans. The daily TO-DO list serves to identifythe daily tasks that aperson must complete in order to support their outcome objectives. Achieve greater daily productivity while preserving internal and external resources. Learn and put into practice a systematic process that efficiently leads to the achievement of pre-set objectives. Create a Motivational AchievementPlan that contains objectives that are specific enough to measure progress, realistic based on the resources available or attainable, and with benchmarked enabling objectives along a timeline that ends with the achievement of the outcome objective. Professional athletic organizations regardless of size are all seeking toimprove productivity, efficiency, and effectiveness in their athletes and intheir organizations as a whole. Like individuals, all teams and workgroups haveareas in which they can improve. While there are many approaches to improvingperformance, it is the combination of management perspective, an appropriateimprovement methodology, and an ability to analyze relevant measures ofperformance that will yield best results. This pursuit of excellence targetscurrent operating procedures, overall organizational cohesion, andcommunication between internal teams or positions. Improve cohesion and synergy in the organization or team. Clarify roles and identify obstructions to the flow of communications. Develop standard operating procedures for norms in the workplace including prioritizing tasks, conflict resolution, articulating ideas and creativity, and quality assurance. Establish realistic goals and follow-on action plans in an effort to improve the organization. The Stress & Energy Regulation Training program is a self-developmenttool designed to empower athletes with the knowledge of how their bodyregulates energy, and how this plays a major role in their performances.Mastering regulation techniques for energy is the key to sustainment of highlevels of performance, and increasing daily productivityin practice. It alsoteaches individuals how to manage stress contributing to, and sustaining, ahigher quality of life. Regulation is achieved through a program designed tocenter focus, preserve energy, and reaffirm critical objectives daily amidsthigh levels of distractions and other forms of human adversity. SERT isintegrated across most of the performance enhancing sub programs for goodreason. Regulating energy is a critical component for successin sustaining highlevels of performance when adversity is at its highest. As with the MAP, SERTfocuses on individual integrity, or the wholeness, of the person engaged in theprocess. Energy regulation training is most effective when it is delivered in twophases. The first phase is education where the athletes learn how their bodynaturally regulates energy, and how they can control energy outputs. The secondphase is a program of independent practice with an individual HRV Biofeedbacktool. Learn and put into practice a systematic process that efficiently leads to the achievement of pre-set stress & energy regulation. Learn functional energy regulation techniques utilizing biofeedback devices.